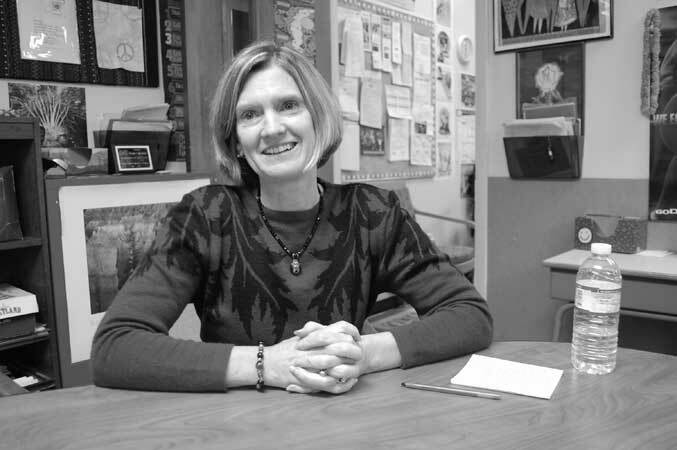 "Middle-school kids are an exciting age-group to work with," says Fran Calciano of Roosevelt MS, named Oregon School Counselor of the year for 2012-13 by the Oregon School Counselor Association. "They come in looking and acting like children. They leave looking like young adults." Calciano grew up on Long Island, studied at Boston U, then moved to Eugene for her final two undergrad years. She graduated in 1979 and taught at Spring Creek, Bailey Hill, and Roosevelt schools, while enrolled in a UO counseling psychology masters program. She married Frank Calciano in 1983, got her degree in 1987, and worked part-time at counseling in several Bethel, Crow, and Eugene schools while their three sons were small. She got back to full-time work at Roosevelt in 1999, when Dennis, the youngest, started kindergarten. She teaches a 12-week class called Healthy Choices that reaches every sixth-grader during the school year. "We deal with stress management, communication skills, career interests, alcohol and drug prevention, bullying, male and female anatomy, HIV and sexuality," she says. Calciano also launched a lunch-time mentorship program for kids who could benefit from another adult in their lives and a support group for kids living in shelters. "This is my 34th year," she says, "and I'm not burned out at all. Working with young people keeps you young."